This watermelon alcoholic drink is the perfect low carb alcohol drink for summer! With its refreshing taste of mint, watermelon, and lime – it’s a delicious take on the classic mojito! I had yet another one of these delicious fresh watermelon cocktails recently and boy are they good!! It is the PERFECT low carb alcohol for sure. I’m not the only one that enjoyed this refreshing watermelon mojito, either! It’s perfect for any summer gathering – potluck, block party, pool party, or even a BBQ! Everyone will go nuts over these low carb drinks – especially if they’re big watermelon fans like me!! The next time you slice into some delicious watermelon, be sure to put some aside for some delicious low carb alcoholic beverages! If you love watermelon drink recipes as much as I do, it is well worth setting aside some of that juicy watermelon for some keto cocktails. Just scroll down to the bottom of this post and follow the easy step by step directions to make your very own low carb alcoholic drinks! You are sure to love these refreshing summer watermelon low carb cocktails. What is the lowest carb alcohol? When it comes to low carb alcohol drinks, there is still quite a selection. Liquors are the best since they have no carbs, but there is also low carb beer choices, as well as some wine choices. Just be sure to avoid anything overly sweet and flavored as they are high in carbs from the sugar and sweeteners. If your like your alcohol…. you’ll need to find keto alcoholic drinks that won’t send you out of ketosis. First you need to focus on drinks that aren’t sweet as they will contain sugar that all breaks down the same way in your body. So what should you drink? The easy answer is liquor as they all have 0 net carbs. This includes things like vodka, rum, gin, tequila, and whiskey. Whiskey is a great choice when you’re on the keto diet as it is not only low-carb… it is NO carb! Most, if not all, choices you come across will contain 0 net carb. Whiskey is a dark liquor made with fermented grain so it generally has no added carbs or sugars – making it a great drink for the keto diet. What is the best low carb wine? If you’re a big wine drinker, you will want to stick to unsweetened and unflavored champagne, dry red wine, and dry white wine. These typically range in the 4-5 net carbs range but many can be found to have even less. Dry wines are made with grapes that are not fully ripe yet and do not contain the same level of sugars as other wines and do not go through the process of adding sugar to the wine. You’ll want to avoid any wines that claim to be “late harvest” as they are very high in sugar. One of, if not THE lowest carb wine you’ll find is a sparkling white wine. It contains only 1.5 carbs – making it a GREAT wine to consume on the keto diet. Do flavored vodkas have more carbs? Flavored ANYTHING generally has more carbs. They are sweetened and no matter the source of that sweetness, it breaks down in the body the same way and can send you back out of ketosis as previously mentioned. All major plain brands of vodka contain 0 carbs, but the sweetened versions may contain high amounts of carbs. Some brands will claim their sweetened versions have no carbs, but you’ll want to keep a close watch or just skip them completely. For this watermelon cocktail, you want to create a nice puree with your watermelon prior to mixing together this watermelon drink. Be sure you get all the chunks for the best watermelon juice cocktail! From there, the basics is mixing together a few ingredients, separating them out, and adding the liquid. Be sure to scroll down for the full recipe for your low carb mixed drinks, but that’s the gist of it! The great thing about this watermelon rum cocktail, is it can easily be made into a mocktail for kids! Just omit the rum from this watermelon rum drink, and you know have a fun refreshing summer drink for the kids! They will love feeling like they have a fancy drink just like the adults. The flavors of fresh mint, lime, and watermelon shine in this fun summer cocktail! Rum is the perfect accent, but feel free to skip it for the mocktail version. 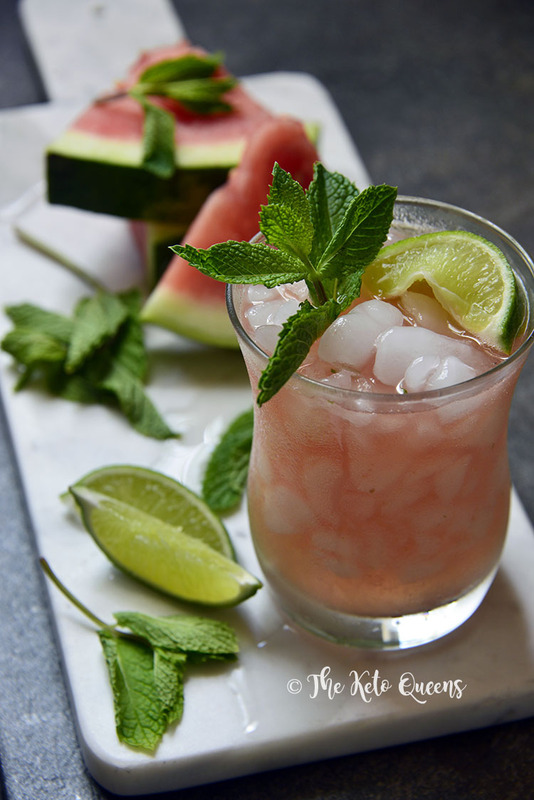 Muddle the rum, mint, and stevia together; mix in the watermelon puree. Pour 1 cup crushed ice into each of 4 glasses; divide the watermelon mixture between the glasses and top each with ¼ cup sparkling water. Squeeze 1 wedge of fresh lime into each glass. Top each with fresh mint if desired, and serve. This watermelon mojito recipe contains alcohol and is only intended for persons aged 21 years and older. Please drink responsibly!